Hi, I am interested in your 1995 Chevrolet Camaro (stock #4899-CHA) listed on Autotrader for $13,995. I'd like to get more information about this vehicle and confirm its availability. 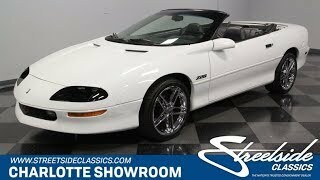 Low mileage, the best options (including six-speed manual,) and some very cool upgrades thats what this 1995 Chevrolet Camaro Z/28 convertible has to offer... and its all at quite a nice price. The appeal of this modern classic is black & white... literally. The factory-correct Arctic White retains a well-preserved radiance in the sunshine. This is what you get when you look at a car that has been in the same family since 96 and has averaged less than 2,300 miles annually. Of course, on a Camaro so well preserved, youre going to find every detail in place right down to the well-integrated spoiler and correct Z/28 badges. It all tells the rest of the world that this was the fastest and best-handling Camaro in its day. Even the white convertible top looks great in-place. But this one also has something more going for it, too. While the original wheels are also available (please ask for details), we cant help but love the sporty flair that you get with these upgraded Corvette Z06-style polished alloys. While this looks great with the top up, theres a whole new attitude when you take it down. The black interior coordinates with the black accents on the exterior to create a truly appealing total package. The leather buckets in front are grippy in the corners and the drivers one electronically adjusts to be comfortable for all-day drives. Its loaded with more great features like power locks, dual airbags, cruise control, tilt wheel, and an upgraded AM/FM/CD stereo (the original comes with the sale, too.) Plus, with a power convertible top and power windows, you dont even have to leave the drivers seat to go from enclose comfort to a wind-in-your-hair experience. And with ice-cold air conditioning, you can do this even in the summertime. A modern classic means modern fuel-injected power. This is the top-of-the-line 350 cubic-inch V8 that was shared with the contemporary Corvette. The LT1 motor was rated at 275 hp for this Z28, and in this survivor-grade drop top, the V8 shows all signs of being original. Youll experience the best of this V8 and its rumbling soundtrack thanks to the control of the six-speed manual transmission a rarity in these Camaros. Plus, this Z28 has the benefit of an enhanced handling package, power steering, ABS, and four-wheel disc brakes. Complete with owners manual, heres a well-maintained, high horsepower future classic thats being offered for the price on an economy hatchback. This kind of irresistible packaging wont stay long in our showroom. Call today!! !